As someone who’s in front of a computer watching and playing games a lot, it goes without saying that my equipment is really important to me – but this isn’t something people discuss particularly often. In my personal case I have a back injury which means I’ve done a bit more homework than most regarding my desk height, posture and chair. However, today I’d like to discuss something that at one point or another has come across the minds of gamers everywhere – the mouse. For those of us who have been around a while (food for thought: the newest generation of gamers have never used a ball mouse! 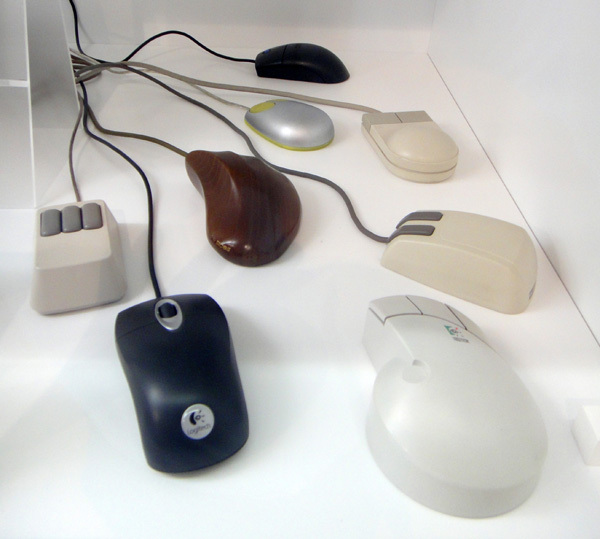 ), technologically there have been lots of incremental evolutions of mice over the years. We started with ball mice where quality mechanics ruled the roost, then moved on to optical with the odd laser mouse coming into play – all the while with ever-increasing DPI capability. I’m not going to bother talking about these today; I’d like to come at the question of what mouse to choose from a more practical standpoint. I’m going to start with the assumption that unless you’re a top pro-gamer or have your mouse sensitivity on stratospheric that you won’t notice the difference the last 200DPI makes once you start hitting numbers over a few thousand, unless you’re the kind of gamer that enjoys the fluttering wings of a butterfly in a nearby forest affecting your aim in an FPS game, ha. The things I care about most are comfort and function, importantly in that order. A bolded point in this article is a key consideration or learning that I took away during testing of a gaming mouse. I’m also going to avoid super-obvious common sense stuff like “Make sure it’s comfortable!”, as I’m sure all of you will already veto even a fantastic technical mouse if it just doesn’t feel comfy. However, bear in mind you can’t always test mice before buying them as much as you’d like (not just because of packaging etc.) so I’ll try and throw in considerations that can be made both pre- and post-hands on. The first thing to be very aware of is your grip on your mouse. There is no right or wrong grip, but by knowing how you grip your mouse you can immediately see if a particular model would be inappropriate for how you old yours. Generally speaking the palm grip (which is also what I use) is the most common and popular, with the claw and fingertip grips less so. You can already begin to see a few things about what kind of mouse might be unsuitable for some users: for example, someone who uses a fingertip grip might not like a large back-end to their mouse (which may be great for someone who uses a palm grip) as it could press into their hand when they wouldn’t like it to. 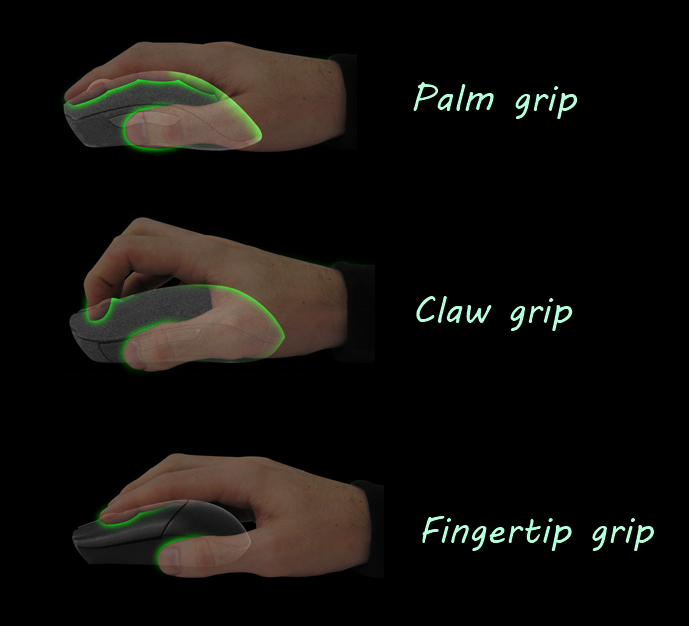 Claw grip and fingertip grip folk also usually (but not always) tend to favour smaller mice, as the smaller area of contact between hand and mouse means a lighter one is often easier to flick around and be responsive with. The two mice I end up looking at in this post are both for me as someone who uses the palm grip. Determine what grip you use with your mouse, and rule out using common sense any mice that on a basic level just wouldn’t work with your grip. 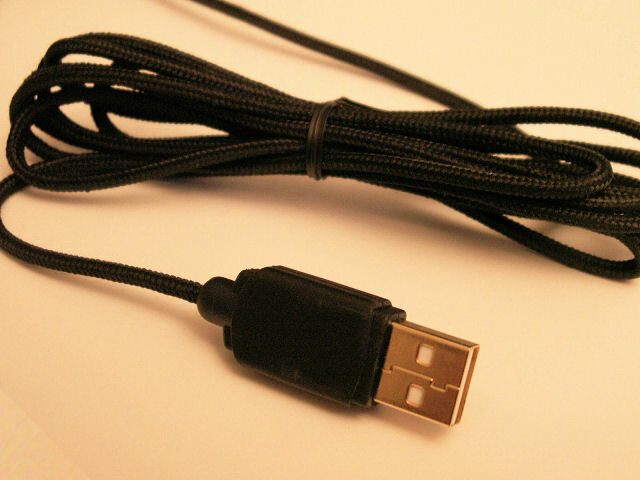 To backtrack for a second and give a bit of context, this blog post actually started as the result of a design issue I had with a previous mouse (specifically the Tt eSports Black) which I found really comfortable but had two of them with frayed cables within just a few months. It was nothing drastic, but the cable during transport simply wasn’t durable enough for me to use with my laptop because I moved around so often. About to give up, I was challenged by Tt eSports to try a pair of mice and really give them a good test – so I took up this offer and decided to put them through their paces as thoroughly as I could…by using them at work for a few months each in addition to gaming. 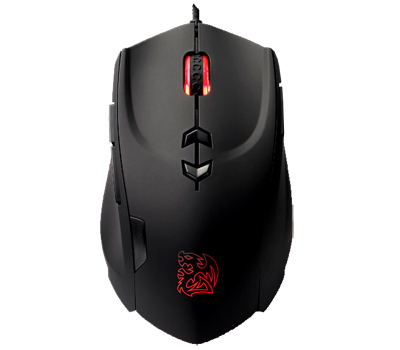 I was recommended to use two mice in particular, the Tt eSports Saphira and the Tt eSports Theron. I used each one for three months to get a good feel for how I would cope with using them long-term (my job involves me sat at a computer for most of the day when away from gaming). Below is a photo of both mice, which you can see are somewhat similar. The Saphira is on the left and the Theron on the right. The simpler design does come at a cost which might be an issue for some (but didn’t affect me): the simpler design of the Saphira means that the buttons for adjusting custom DPI settings were moved to the bottom of the mouse – on the Theron they are the angled buttons in-between the main mouse buttons. For this reason if you are a gamer that hot-switches between sensitivities while in-game it could get a bit frustrating – I suspect most don’t do this though, so is unlikely to be an issue. If you need to regularly switch mouse sensitivity while working or gaming, check to see that the switch on the mouse is quickly accessible. There’s a certain elegance to the design of the Saphira that is becoming increasingly rare in an age where gaming mice are getting more complicated by the week; a smooth, rounded top surface with very simple, flat grips on either side to keep your thumb and ring / little fingers in place. There are no real fancy bells and whistles on-show, and the entire surface (on both mice to be fair) is made of a grippy material which really helps my style of grip in particular. Especially with palm grip users, having a grippy mouse top surface can make a big difference, especially in games where you need to react extremely quickly like FPS games. If you can’t feel this (due to packaging or otherwise in a store), a good quick-glance method that works most of the time is to see if the surface appears matte or glossy through the packaging. I know the above seems like a pretty simple point to make, but the number of gaming mice I have seen where (for good looks) they use a really non-grippy shiny surface is surprisingly large. Some mice also claim to have a grippy surface but most that say this and are glossy in appearance still slip an awful lot when your hand sweats even a little bit during a longer gaming session. I won’t name names here, but I’ve used a few mice in the past that did just that which really disappointed me after a few days of use, especially when I’m playing FPS games like Counter-Strike. After using the Saphira for three months (working weekdays and gaming weekends) one thing I can definitely confirm about it is that after extremely long days I don’t feel like my hand / wrist / arm is tired from using the mouse; it really is fantastic for longer sessions. My only niggle with it came down to something highly personal; I found that after a while I noticed the mouse really came ‘up’ into my palm due to having such a large curvature. While this wasn’t uncomfortable at all, it meant that when I flicked from side to side during gaming I was guiding the motion using more of the middle of my hand, rather than pivoting more from my wrist where my fingertips provide the most movement. (Optional, as it’s not that big an issue) When you move your mouse quickly, have a little think about the movement in your hand and wrist: where is your movement coming from, is your main pivot your wrist, hand or shoulder? Can your mouse and its shape complement that? Switching to the Theron also took a bit of adjustment; it’s flatter on top, is in general more ‘sculpted’ than the Saphira and while the photo above doesn’t quite show it, it’s slightly shorter and wider. This actually suited the shape of my hand and style a bit more once I got used to it – I thought the Saphira suited larger hands because of its longer shape and higher curvature, and I felt marginally more comfortable with the width of the Theron as my thumb had a nicer place to rest (note on the side of the Theron it curves outwards on the thumb side so there’s a little bit more of a natural rest point). My biggest worry with the Theron was actually the buttons for adjusting mouse sensitivity. These are the angled buttons below the mouse wheel that you can see in the image above. I occasionally at work use three fingers (index, middle and ring) on the top of my mouse because I scroll a lot, and two fingers (index and middle) when gaming. In both cases, I thought my middle finger may inadvertently strike the sensitivity setting which would be especially frustrating in the middle of a game (for those wondering how this is possible with just two fingers on the top of your mouse, when my middle finger is on the right mouse button the first knuckle of my finger is still hovering very close to the centre of the mouse). Happily, it turned out this wasn’t an issue at all. Because of the larger sculpting / depression with the left and right mouse buttons, I found my middle finger when gaming sits more comfortably towards the right side of the button and as a result the sensitivity buttons don’t get in the way. Similarly when working, my middle finger is very rarely extended fully (usually slightly bent on the scroll wheel) and that also means the angular buttons are surprisingly well placed to stay out of the way unless you need to use them. If you use your mouse on-the-go often (like I do with my gaming laptop), I recommend always getting a mouse with a braided cable. This is important as you’re (gently please!) folding up the cord multiple times a day and you need longevity from your equipment! Finally, something that’s worth mentioning at least in passing is the mousepad / mouse mat – how mice combine with the surface you use them on is incredibly important to be at the top of your game, but with this I genuinely believe that past a certain quality there are significant diminishing returns. Once you find a mouse surface (whether you like a hard, flat surface such as wood or a metal mousemat etc. as opposed to say, cloth, which I personally prefer) that you’re comfortable with, get something you like and stick with it – but as long as it’s of half-decent quality I would not go round spending a lot of money on an absolute tip-top surface as I don’t think the incremental value is worth it when compared to the importance of being comfortable with your mouse. At the end of the day, it was ridiculously tough to choose between the two mice. I ended up marginally sticking with the Theron, because (and I love WhiteRa to bits!) although the Saphira had very simple elegance and good stamina about it, I found the Theron overall slightly more comfortable due to my hands not being large enough to take full advantage of the Theron. The more sculpted shape of the Theron combined with the button placement being a lot smarter than I originally anticipated (my fault!) meant that it just felt better for me to flick around. My biggest surprise – since this was an experiment after all – was how much information I was able to gleam from using these mice in a day-to-day environment at work. I think it isn’t necessary to specifically switch out ‘normal’ and ‘gaming’ mice, and to have something that works in both environments is great for the majority of us. I hope this was useful to someone perhaps looking for some of the less talked about points (aside from the obvious “comfort!” which I should say for the sake of clarity still needs to come first) when it comes to choosing a gaming mouse. A special thanks as well to Kitty Mach and TteSports for giving me the mice to try out (they don’t sponsor me or anything, they were just unbelievably helpful!). Great post. I have had a Theron for over a year now and i think it’s a great mouse. Long gaming sessions (Lan events) I use it and have never noticed am issue with it. The only minor gripe I have is the drivers – there is no way to turn off the big red arrows that appear on your screen with the forward and back buttons. If course the nose works fine without but then you lose the ability to change the colour of the lights and to dine tune your dpi. una pregunta. Tengo el tT Esports THERON pero el macro tiene pocos ms como configuro un arma semiautomatica en juegos fps ? just epic, and it will be awesome for players who understand the hard job that you are doing to improve the experience of gaming. Thanks a lot for the review. Been using the sapphira for some time now and it’s great, actually I picked Saphira because of WhiteRa and my trust on GranpaToss Special tactics was very well deserved one of the best mouse I’ve used in over 15 years of gaming (5 of them professionally).